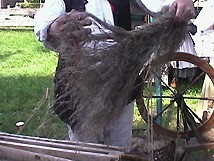 The flax process is used to make linen fabric. Egyptian tomb paintings document the early use of the flax plant to make linen thread.This process is time consuming, especially when done by hand as the early Americans colonists did.Today machines are used to make linen fabric. They planted the flax in April and harvested it in July. 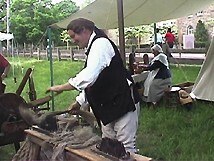 The photos of the flax process are from a demonstration by Christian Zinzendorf at the Mercer Museum Folk Fest in May 2001. After soaked (or retted) flax has dried, the stem is cracked on a tool called a flax break. 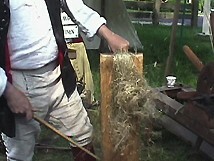 Small bundles of flax are placed across the lower wooden blades; the upper blades break the outside chaff. The inner soft fibers are the part of the plant used for the fabric. 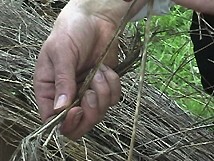 Once the flax has been worked on the flax break it is flexible. The scutching knife is struck against a vertical wooden board to remove the loose pieces of stem from the fiber. A comb (or hatchel) separated the long fibers and removed the short ones. 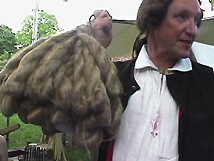 The short fibers (or tow) were used for bags and ropes. 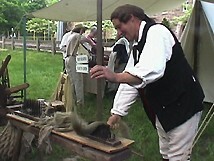 Fibers from the finer comb (or hatchel) were used for work clothes. Skill is required to avoid cutting the fingers on the spikes of the comb. 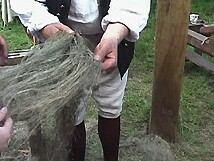 After combing the hatchelled flax, the long fibers are very soft. 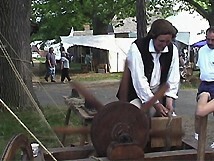 This foot powered machine turns a wheel; the spokes of the wheel beat the fibers as they are clustered in a bundle. 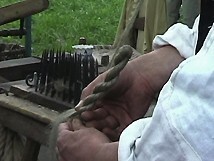 A twist is made from the bundle of fibers by turning one end over the other (almost like making a rope). 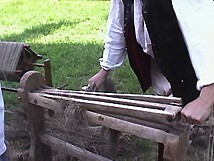 A twist is made to store the fibers for winter spinning. This set of twists is from a Lehigh County, PA farmhouse in the year 1843 shows the durability of the fibers. At that time the canals brought cheap fabric at 7 to 12 cents a yard. The twists were not thrown out by the German farmer.